On July 16th I rode from Annecy to Chambéry, crossing over the Semnoz along the way. Another great breakfast in Annecy, this time enjoying the eggs I discovered yesterday, too late. I checked out of the hotel, carried my bike from the basement for the last time, and headed toward the climb of the Semnoz, on the southern side of town. I became aware of this climb last year when it was the finish of the next-to-last stage of the Tour de France. Nairo Quintana won the day. That year they started in Annecy but came up the climb from the west, whereas I started from the north. The routes meet up midway up. Getting passed by a bus, one of many times. The climb almost immediately enters the woods, where it will stay nearly the whole way up. Since I got a reasonably early start I had the road to myself, but as the morning wore on I started seeing more traffic. Not so much cars, but buses, and lots of them. A little while later I passed a school, which I guess explained that. The climb is moderately steep, and as the day warmed up I was grateful for the nearly-constant shade. Eventually, as I approached the top, the trees dropped away and exposed pastures and ski runs. Semnoz isn't a pass, it's a mountain top. The road doesn't quite reach the peak, but there's a short hiking trail to the top. I didn't take it. At the top there are fantastic views of the Alps. Each mountain has its own shape -- some snow covered, some pointed, some flat. This was the first time I was able to recognize its distinctiveness of Mont Blanc. Now that I think about it, this might also have been one of the few times on this trip when the weather was good enough at altitude to get really great views. Semnoz delivered. Panoramic view from (near) the top of Semnoz. The descent was remarkably fast, down long straights down into the valley. I picked out some minor roads heading generally south, but I doubt you can go too far wrong in this basin. Eventually I started the surprisingly long climb out of the valley. It was hot, and I even ran out of water. I had to fill up at one of the ubiquitous village fountains. After passing the Col du Plainpalais, I descended into Chambery. After the charming Annecy it seemed a little humdrum, until I actually found my hotel in the old town, tourist area, the vieille ville. Another amazing town, with cobbled streets mostly closed off to traffic, and hidden treasures around every corner. Little things like, you know, surprise cathedrals. Around dinner time there was what seemed like a good-natured protest parading through town. Good natured as it may have been, there were nonetheless police standing around in the intersections. I never did discover what it was about. I violated a rule I had devised on this trip by eating at a restaurant with "pizzeria" in its name. It was friendly and serviceable, ravioli and a jug of wine, but... and I realize this is going to sound snobby, but... powdered Parmesan cheese. I really thought we were beyond that, as a civilization. This day's ride was almost 48 miles, with over 5800 feet of climbing. The climb up Semnoz was pretty steep, and indeed the most difficult kilometer of the ride was a 9.3% stretch in the middle. But the climb out of the valley, in the mounting heat, was definitely the most difficult part of the day. 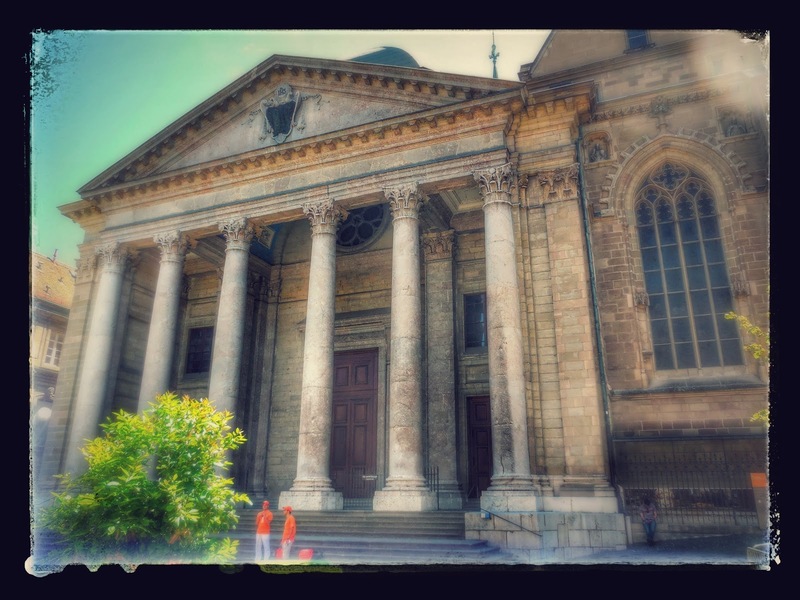 On July 15th I took a side trip from Annecy to Geneva. When I planned this trip I wanted to have a few places to stay for more than just a night, in case I needed a rest. Annecy was one of those places. I thought if I didn't need a rest I might try visiting Geneva, partly because it's a major city of global importance and largely for the lark of visiting another country by bicycle. All in all, there wasn't a lot of thought invested. I had a good breakfast in the hotel, with eggs... available. I didn't notice them until I was already done. The Pont de la Caille, a vestigial suspension bridge. I started riding north, in fine weather, nominally in search of a bike shop. 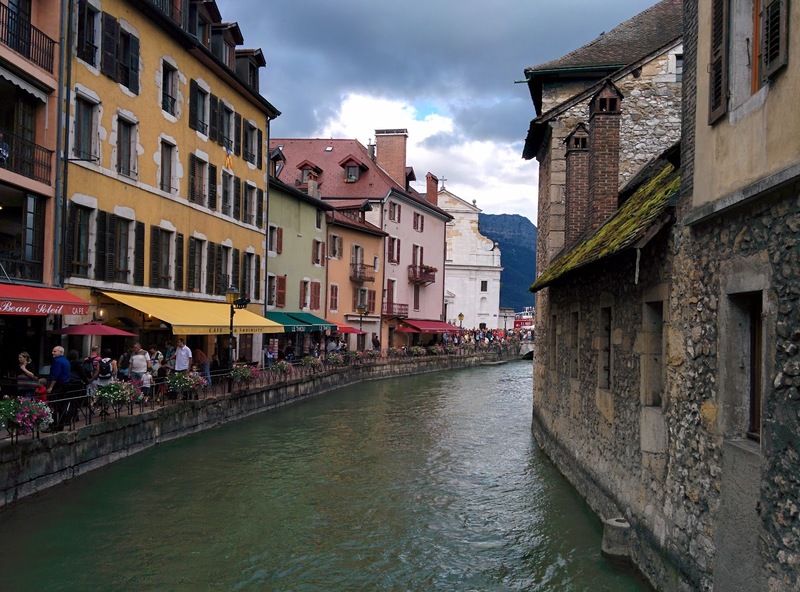 As it turns out, the outfit from which I had rented my bike was headquartered in Annecy, so I asked for advice about getting the bike's broken rear spoke fixed. I got a polite reply, but it pointed me to a bike shop whose web site clearly said it had been closed for two months. So I was going to ride by, but didn't hold out much hope. The most helpful bike shop, anywhere. In the event, it was indeed closed, but it was on the way. In fact it was on the Avenue de Genève, which certainly sounded on target. I followed the Avenue de Genève, eventually linking up with the busy and anxious D1201. I followed this for a while until I happened to ride by a bike shop that was open. I stopped, asked about the spoke. Ten minutes and 10 € later it was fixed! Finally! This was at Goodman Cycles in Allonzier-la-Caille. They were really friendly, too. The bike felt so strong and efficient after that. I had long since resigned myself to living with that broken spoke through the rest of the trip, but it was not to be so. The mighty Col du Mont Sion. Call it a Category 4, on a light day? Reaching Geneva meant crossing a small rise, in this case called the Col du Mont Sion, elevation 786 meters. It may not seem like much, but they dug a 3 km tunnel so the highway wouldn't have to cross it. I didn't know what to expect when crossing the frontier, but I had my passport just in case. As it turns out there's an official border crossing, but it wasn't staffed. I sailed through, feeling like a spy. From this point forward, I had no real plan. I had no idea what sights there were to see in Geneva, and no Swiss Francs. I headed vaguely toward denser urbanization, and accidentally ran across a few really interesting sights. I must admit that I expected a heightened level of conformity with cycling laws in Geneva. Is that unfair? It was certainly incorrect. Cycling through town was much like New York would be, if cycling were regularized -- opportunistic, casual, efficient. end up at my hotel in Lyon. As you might expect, Geneva is something of a maze of one-way roads. Occasionally I would decide I needed to get somewhere, only to find that essentially all roads were one way, the wrong way. It gets a little frustrating. The Cathedral of Saint Pierre, after heavy processing. Although it was around lunchtime, I didn't quite find a place to eat that met my narrow needs -- suitable for a sweaty cyclist, in sight of the bike, and not a lousy tourist food stand. I decided that my exploration was good enough, and started back. At L'Etape, wine from Mont Ventoux! I didn't really want to take the same route back, partly for variety and partly because D1201 had been loud and busy. Ultimately I largely followed the same route, but took side streets wherever feasible. On the way back I saw signs for the Col du Grand Colombier. And having looked that up, the confusingly similarly named Col de la Colombière, more frequently a part of the Tour de France, is also nearby. Maybe I missed a bet; it would have been interesting to work one of those into the schedule. I suppose they can wait for next time. Back in by-now familiar Annecy, I had dinner at L'Etape. A salad with filo dough wrapped cheese, a surprise fish (good, but it wouldn't hurt to read the menu more closely) with risotto and sweet potatoes, and another crème brûlée. And a bottle of wine from Mont Ventoux! While the profile looks dramatic, this was an easy day. A little over 55 miles, with 2800 feet of climbing. The most difficult kilometer only averaged 5.4%. And my bike was fixed! 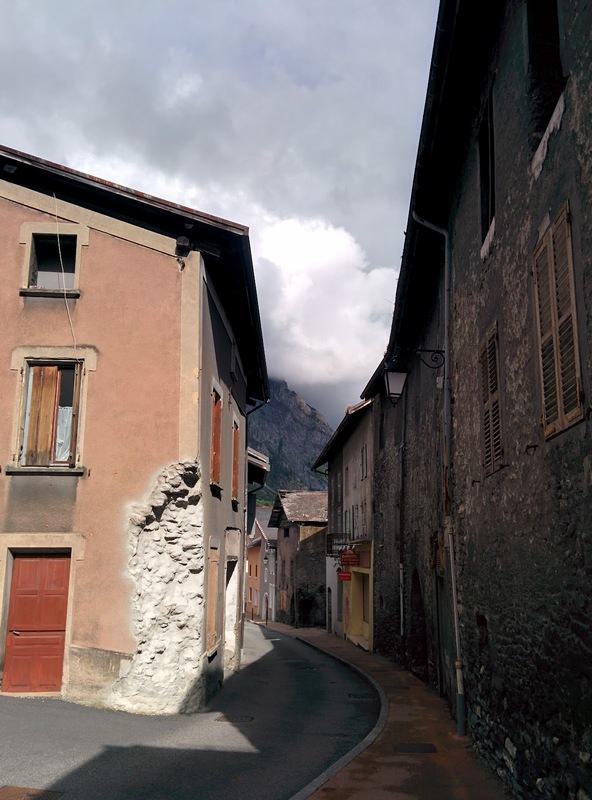 On July 14th, I rode from Tournon to Annecy, discovering two minor mountain passes along the way. After a lovely little breakfast at the B&B, I got my usual early start. When I told the proprietor that I was headed to Annecy, he knew I would be crossing the Col de Tamié. I found that comforting, in a way, that people know about these "cols" outside of cycling. Again I was putting miles on a wounded bike, but by now I was gaining confidence that the broken rear spoke wasn't going to make the rear rim get any worse. And given that today was a holiday, it certainly wasn't going to get fixed today regardless. The morning was very pleasant, becoming slightly muggy as I climbed. The fog got thicker as well, particularly as the road began passing through woods. At the top there was the usual sign, and I took my usual picture next to it. The previous evening the B&B proprietor had mentioned the Abbeye de Tamié, which produced the cheese I had for dinner and may have been originally responsible for the building I slept in (that part wasn't quite clear). I was expecting it to be right there at the summit, but as it turns out it's a little further along. There was a sign for a turnoff, and since this was a short day, I was inclined to take all the side-trips that sounded interesting. I followed the driveway for a bit, not really knowing what to expect, and eventually came to a sort of visitor's center. Clearly this was a larger operation than I expected, and since I didn't really want to invest that much time, I continued on my way. A little further along I saw signs for a Grotte and Cascade (i.e. cave and waterfall), so I followed that lead, too. It took me down some little roads that I wouldn't have seen otherwise. That was good, but the actual destination was a tourist area; you couldn't see anything from the road. I continued on. My plan was to follow the road along the west side of the lake, the left side from this direction, to the city. But as I was pedaling along I saw a sign for the Col de la Forclaz, which seems to go around the east/right side of the lake. Well, why not? I came to learn that the Col de la Forclaz is a substantial climb, marked as 8 km but that includes some downhill sections. It was very steep, with lots of sections of 10% or more. The most difficult kilometer was in this section, at 11.4%. If you're looking it up, you probably want to know that there's a different pass in Switzerland with the same name. This one has been used a few times in the Tour de France; I think in 2004 it was a category 1 climb (and the Col de Tamié was a Cat 2 in the same stage). Apparently the pass is used as a base for paragliding. It was busy as I passed through, with a few cyclists and lots of others enjoying the hiking or paragliding. I headed down the other side a bit, found a good spot for a picnic, and had a sandwich. Shortly afterward it began to rain. It was coming down hard, but not especially cold, so I was happy. The rain let up just as I entered Annecy along its very pretty lakefront. After being disappointed in my brief exposure to Albertville I wasn't expecting much, but Annecy turned out to be fantastic. The infrastructure seemed healthy, the lakefront was lively, and the touristy old town was much more than I expected. This place even has canals! At the hotel they put my broken bike in the basement ("backstage", as the hostess put it), and I showered and enjoyed the sights. Dinner was a terrine, Tajine du Poullet (a sort of stew with chicken thighs), and crème brûlée. As it was also Bastille Day, after a short rest at the hotel I went back down to the lakefront to see the fireworks. I hadn't asked anybody where they would be; it was pretty obvious. The park filled with tens of thousands of people and finally the show started. 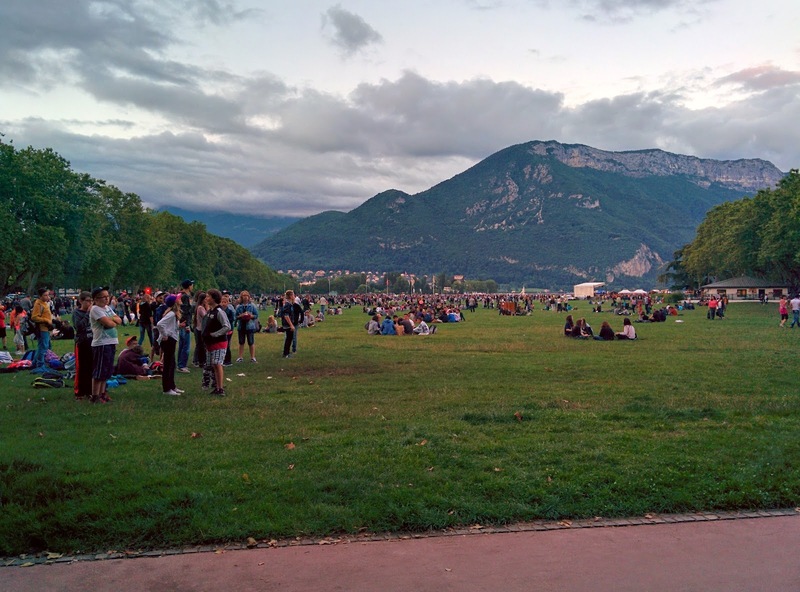 It was fantastic, similar in scale to those of Washington, D.C. on the Fourth of July, despite Annecy being a relatively small town. This was a short day, at just 33 miles and 3800 feet of climbing. The day held several discoveries, notably the fierce Col de la Forclaz climb and the wonderful town of Annecy. On July 13th I rode my bike from Saint-Julien-Mont-Denis to Tournon, near Albertville, along the way crossing the Col de la Madeleine. Two days before earlier, I broke a rear spoke on my rented road bike.That was the 11th, a Friday. The next day I rode down to Saint-Jean-de-Maurienne, the largest town in the area, in the pouring rain to try to get the spoke fixed. The large sporting goods store I stopped at had a promising bike repair facility, but the responsible employee told me he would have to order a spoke. What am I riding, a penny-farthing? The result was that on this day I still had a broken spoke, and as it was Sunday there was little chance of changing that (and the next day was a holiday, but one day at a time). By now I had put in 10s of km on the weakened rear wheel, and since the wobbly rim was always not-quite rubbing I would have known if it had got significantly worse. So I decided to just ignore the problem and enjoy the ride. For two days now I had been looking across the highway at a little town called Le Bochet. I decided that, rather than take the busy main road up the valley, I would take the side roads through that village. After the previous day's frustration, that was a very enjoyable ride, first running past one of the giant factories in this valley, and then through the cluster of houses tenaciously hanging on to the mountainside. I passed through Saint-Jean-de-Maurienne, not stopping but not missing it since I had spent quite a while there the day before. Again I took side roads northwest through the valley to La Chambre, the base of the climb to the Col de la Madeleine. An energizing ride so far. The Col de la Madeleine is crossed by the D213 road, connecting the valley of the Arc river with the valley of the Isère. D213 starts right in the village of La Chambre, at the intersection of a little shopping area. No bike shops, though. The day was gloriously dry after the previous day's heavy rain, but on the lower slopes of this climb it started to feel warm. I stripped down to just a normal jersey, no undershirt, the lightest I had dressed this whole trip so far. The road seemed to run through clusters of hairpins, followed by longer winding sections. There were occasional villages, including Saint-François-Longchamp at which I refilled my bottles with water and my body with a nice sugary tea or some such thing. Nice marker showing the climb, not to scale. In this direction the climb is 19 km at an average of nearly 8%. It's steady but long, just plain long. At least it got cooler as it rose. At the pass itself there was the usual little clutch of stores and a restaurant, with a generous parking lot being used by hikers and other folks enjoying the sights. I ate a sandwich for lunch and headed down. dramatic, with the road clinging to steep mountain faces, and several villages doing the same. The road passes over fast-flowing streams and through picturesque woods. It's seems like a much more interesting and varied climb. Maybe next time I'll come this way. On the climb I hadn't been thinking much about my broken rear spoke and wobbly back tire, but it was hard to ignore on the descent. Again the rear brakes were not very effective and worse yet unpredictable. Near the bottom of the descent I blew my front tire while braking for a hairpin turn, quite possibly because I was over-relying on the front brake. I managed to get the bike stopped without crashing, but it was close. Once in the Tarentaise Valley I headed northwest toward Albertville, mostly following D990 but taking small unmarked roads when possible. When I got to Albertville I remembered that it had been the site of a Winter Olympics, and that's about all I knew. I think I must not have seen the most interesting parts of town, because it certainly looked like there hadn't been any investment since those Olympics in... what, the 1950s? I was later reminded that the games hosted here were in 1994, which means I definitely must have missed the best of the city. My hotel was in Tournon, a village down the valley a few kilometers, then up a hill. The tiny B&B style place didn't even have a numeric address, so I didn't have a lot of faith in the pins the map services showed me -- they were probably just centroids of the village area. I peeled off of D201 onto some unnamed road, climbed a kilometer to D201c, then since this was the main road through Tournon I just continued climbing until I saw a sign. The hotel. A bed and breakfast. Not dinner, breakfast. with apple juice. Unfortunately I had assumed that they had a restaurant, but as a small three-room hotel they only cooked for large parties. Since it was Sunday, relatively late and the nearest restaurant would be quite a climb away, I would again go hungry. Well, nearly so: they kindly scrounged up a wedge of cheese from the nearby Abbeye de Tamié, and a cup of yogurt from a local dairy. Not too bad, actually. This was also the night of the World Cup final between Germany and Argentina. I fell asleep before extra time commenced, and therefore missed the winning goal. Today's ride was just over 60 miles, with just over 6000 feet of climbing. The most difficult kilometer was somewhere in the middle of the climb, with an average grade of 9.6%. The climb of the Col de la Madeleine, as a whole, was definitely the most challenging climb of my trip, both as I experienced it and in the semi-objective rating of my analysis program. On July 11th I rode from Briançon to St.-Julien-Mont-Denis, passing over the Col du Galibier on the way. After missing a proper dinner the night before, I was pleased to find a bountiful breakfast at my hotel in Briançon. I took good advantage of that. I felt like I was going to need a lot of energy today. I got my usual early start and promptly headed up toward... Italy, actually. But I turned around and headed back up D1091 toward Col du Lautaret, reversing my course from the day before. The climb is very gentle, at times hardly even registering as a climb. The road runs through some little villages, then becomes a little more isolated as it approaches the pass. I passed a couple of flocks of sheep, each with a shepherd watching them from the road. Not many fellow cyclists on this day. Two years ago I passed through here. On that occasion I had a lovely omelette, sitting outside in the sun with a view of the Lautaret Glacier. That omelette loomed strangely large in my planning. I had planned to get to the pass around lunchtime, which worked out. As it turned out it was far too cold to sit outside, and I ended up eating at the other restaurant at the pass. Anyway, I got my omelette. Looking at my GPS track, I'm surprised to find that I spent about an hour having my leisurely lunch and generally loitering around the area. But eventually it was time to continue, and I headed up toward the Col du Galibier. I'm surprised to see, as I'm writing this, that this road is also labeled D902, just like the road up to the Col de l'Izoard. Maybe it was the long rest, maybe it was the magical power of the omelette, but I felt really great on this climb. It runs through stark terrain, with exposed rock, grass or moss, and not a tree to be seen. You can see the road for miles ahead. I think the last time the Tour de France climbed this side of the road was 2011, and the road was still covered with exhortations for Andy and Frank Schleck, and the Leopard team. That day was near the peak of poor Andy's powers; as I was passing over his name he had just pulled out of the 2014 Tour a couple of days earlier. There was a fog hanging over the pass as I climbed toward it. Once I arrived I found the top almost deserted; it was just me and two other cyclists. Just enough to have someone take my picture, as it turns out. At 2642m this was now the highest point of my ride, and indeed would be the highest point I would see until the plane ride home. It was also cold -- about 10C (on that plane ride home I kept an eye on the flight statistics, and as we passed through 2600m I couldn't help but note that the plane also registered 10C). Given the fog there wasn't much sightseeing to be done, so I bundled up and headed downhill. In 2012 there had been little patches of snow up here, but on this day there were large areas of snow by the road, and melting across it. There wasn't much traffic, and the descent into Valloire was relatively quick. As I rode into town, I heard a crack and thought I might have dropped something. After passing all the way around the town once, reminding myself of the place I spent two days in 2012, I headed up toward the Col du Télégraphe. It was at that point that I realized that the crack I heard earlier was, in fact, a rear spoke snapping. Nuts! I turned back around to find a bike shop. The first one didn't have spokes for road bikes; the second one had no shop, but they offered to sell me a jersey and sent me toward another shop that didn't happen to exist. So it was that I just opened my brakes and continued on. Oh well. I felt really uncomfortable with this, particularly as I started down the descent toward St.-Michel-de-Maurienne. The open rear brake didn't work well, unsurprisingly, and had a jerky, juddering, unpredictable effect. None of this lent any confidence to the guy descending on a damp road. Nonetheless, I slowly and carefully made it to St. Michel, the little town at the bottom of the hill, and again looked around for a bike shop. None to be found. Incidentally, Google did no better. Harrumph. The Maurienne, the valley of the L'Arc, from my hotel balcony. I headed down D1006, a busy road despite the convenient highway running parallel to it, down to St.-Julien-Mont-Denis and my hotel. The hotel was isolated, and not only did they serve dinner but they actually had a large neon knife and fork blinking on top of the restaurant. 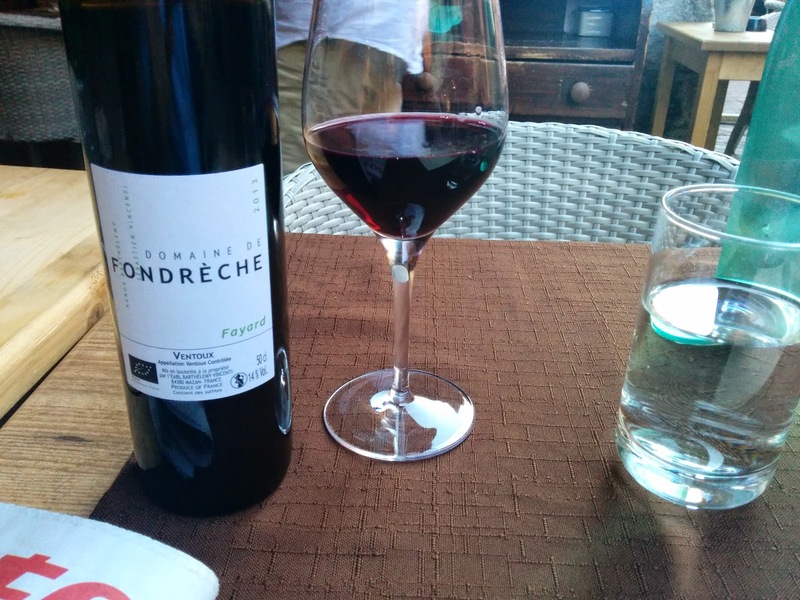 Dinner was a lovely goat cheese salad, local favorite tartiflette, a chocolate tart and a 35 cl bottle of local red wine. Fixing the bike was going to have to wait for the next day. Today's ride was just short of 52 miles, and just short of 5200 feet of climbing. The most difficult kilometer was the last bit near the Col du Galibier at 9.4%, but at the time the excitement of reaching the pass made it feel easy. On July 10th I rode to Briançon, and took a side trip up to the Col de l'Izoard. A few days ago, stage 14 of the 2014 Tour de France went from Grenoble to Briançon, up and over the Col de l'Izoard, then up to Risoul. On my trip I did much the same thing, except that what took the tour five hours took me two days, and I even skipped the last climb. I got my by-now-usual early start of this trip, enjoying a cool but dry morning. Shortly after leaving La Grave you pass through the little Villar d'Arène, and after that the valley is largely unpopulated as it rises toward the Col du Lautaret. Both sides of the Col du Lautaret are long climbs with gentle grades. As I climbed, a cloud layer formed mid-way up the mountains, separating the snow-capped peaks from the lush valley below. up to the Col du Lautaret. I got to the top of the Col du Lautaret, which is marked by a couple of restaurants and a souvenir shop, a little too early for lunch. The elevation at the pass is just over 2000m, the high point of my tour so far, and it was correspondingly chilly and windy. I enjoyed a coffee before putting on all my newly-bought cold weather gear and heading down the other side. The long, mostly straight roads heading down toward Briançon made for a fast descent. The speed isn't extraordinary, but it lasts for kilometers at a time. As on the other side, the top part of road passes through a lovely empty valley, then starts passing through a few little ski-oriented towns. I spent a little quality time in Montier-Les-Bains while fixing a flat, which also marked a good time to strip down to normal riding clothes. I arrived in Briançon too early to check into the hotel, so that meant I would have to take my full, heavy bag all the way up the Col de l'Izoard. Oh well. I had a little lunch and headed down through town. The road up to the Col de l'Izoard is D902, which starts at a traffic circle near the middle of town. It climbs past a few houses and, well, a dump, then actually descends for a little while before beginning the long climb toward the top. Shortly before this trip I read French Revolutions: Cycling the Tour de France, in which the author described the Col de l'Izoard as a "ruined martian landscape." I was therefore surprised that the climb was absolutely lovely. It parallels a stream until it reaches the little village of Cervières. After that the road turns south and gradually enters the woods. were already staking out space on the climb for when the Tour de France would pass by nine days hence. Spending more than a week somewhere just to see the race pass by? I'm a fan, but that seems excessive even to me. On the whole, this climb didn't feel especially steep. The lower portions were a reasonable 5-6%, and while this section in the woods was the steepest it wasn't too bad. The most difficult kilometer of the ride was in this section, at a steep but reasonable 9.2%. With about 1.5 km to go, the trees thin out and the barren pass comes into view. At roughly the same time, not coincidentally, you start to feel the powerful, chilling wind. The elevation at the pass is 2360m, which again marked a new high point for my tour. At the top the wind was fierce, threatening to blow my bike over while I was trying to take pictures. I took refuge in the lee of the souvenir shop. It became clear that the combination of the effort and the cold was having an effect on me when I was unable to figure out which coins would pay for a celebratory nougat bar. That can't be good. A fellow cyclist told me his friend, still climbing, was riding a tandem bike with a Lego man on the rear seat. Honest. He showed me a picture. Hmm... maybe my head was fogged more than I thought. I once again put on the cold-weather clothes and headed back down toward town. I checked into the hotel, watched André Greipel win the Tour de France stage into Riems, and did my laundry. Around dinner time I found that the hotel had no restaurant, and indeed all the decent places to eat were likely to be on the other side of town, near the start of the climb. Only a McDonald's was nearby, and that just couldn't be allowed. So: no dinner tonight. Today's ride was a little over 50 miles, with just under 5800 feet of climbing. The most difficult kilometer was in the middle of the climb up to the Col de l'Izoard, averaging 9.2%.